Backyard Farm | What is ML Reading? When ML was young we lived downtown in a house with a sunny backyard. We turned it into a backyard farm; planting raised beds with tomatoes, lettuce, collards, potatoes, asparagus, cucumbers and many other vegetables. Fig, apple, pear, plum, persimmon and pomegranete trees dotted the yard. Plus, a few muscadine vines. All this on less than a quarter acre. 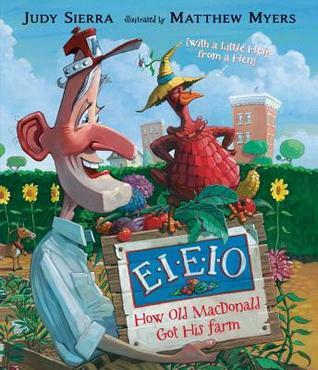 Today, the library received Judy Sierra’s newest book, E-I-E-I-O: How Old Macdonald Got His Farm. I can’t wait to read it to ML. Old MacDonald lives in a small house in a neighborhood. He doesn’t like to mow the grass. So, he buys a goat. Then, a hen who helps turn his backyard into a small farm. The neighbors are not happy. Matthew Myers illustrations are hilarious. From the Better Coops and Garden magazine cover to the parent and child eating carrots like ice-cream. My favorite is the picket line of neighbors holding painted signs… Neighborhood Mud Watch, Our Block is Eroding and Get a Yard. Two years ago we moved. Our backyard doesn’t get a lot of sun… but our front yard does. Last year, we planted blueberries, strawberries, asparagus, muscadine vines, a fig tree and a pomegranate tree. Then, we attempted a variety of vegetables in various places throughout the yard. Sweet peas, carrots, cucumbers, tomatoes, lettuce, okra and butter beans. Knowing which places in the yard these vegetables thrive, we’re adding more to the mix. Spinach, swiss chard and brussel sprouts were planted last week. Thankfully, our new neighbors are not opposed to urban farms. Behind us and up the street are chicken coops. Many of our neighbors grow vegetables and fruit in their yards. This weekend is the kickoff for Plant a Row for the Hungry at Logan’s Trading Company. One of our favorite events of the year. Last year, one of the children’s activities was painting a pot and planting lettuce in it. ML’s pot is on the front steps waiting for this very cold winter to go away. Throughout the growing season, we drop homegrown produce at Logan’s. The Inter-Faith Food Shuttle distributes it to local families in need. Make it a lunch date and visit Seaboard Cafe at the garden center. Fresh made from scratch soups, salads, sandwiches and burgers are available. If the daily special is a barbecue sandwich, don’t miss it. For my readers in Raleigh, check out Raleigh City Farm. Tour the farm, purchase produce, even volunteer at the farm. A great use of an empty lot in downtown Raleigh. This entry was posted in Picture Book and tagged E-I-E-I-O: How Old Macdonald Got His Farm, Inter-Faith Food Shuttle, Judy Sierra, Logan's Trading Company, Matthew Myers, Plant a Fow For The Hungry, Seaboard Cafe by mlreads. Bookmark the permalink. Wow, what a true farm girl you are! I remember you were canning and preserving a few years ago! Proud of you. And your yard sounds “delicious”! Sadly, the canning and preserving went by the wayside with the divorce. Then, the full time job happened. Maybe in a few years, I’ll get back to it. In the meantime, we’ll snack in our yard on whatever the birds leave us.